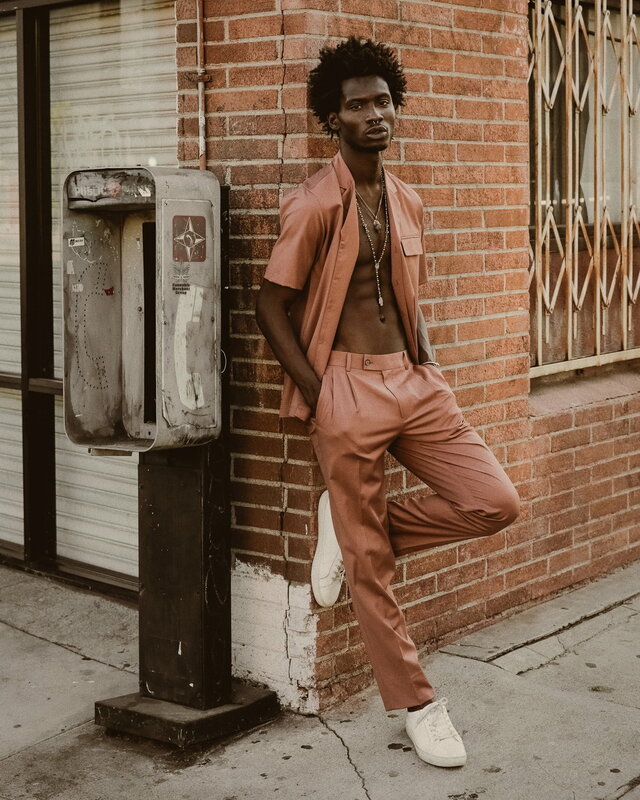 It’s the adventure of modelling that Adonis Bosso most adores; the feeling of not knowing where he will be or who he will be meeting next week. But at the start of his career, such opportunities were looking unlikely for Adonis. The financial crash of 2008 hit the retail industry first, reducing the rates and requests for models. 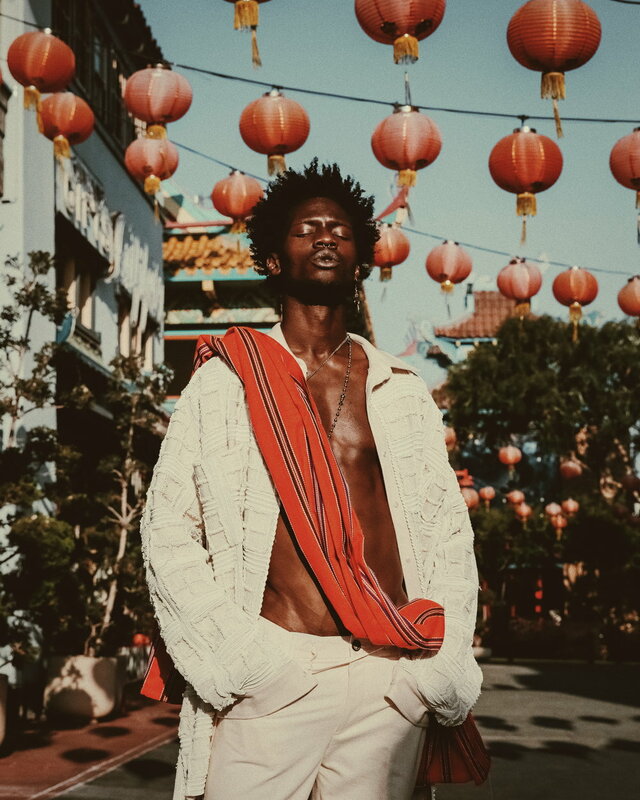 For a black model, the effects were especially damaging: Bosso could not initially get signed to an agency. Luckily, the tide was turning. He was signed the following year and fast became one of the most recognisable models on the runway. His signature septum piercing was a spontaneous decision in Paris whilst he was trying to get signed in 2011. Initially, he wore the ‘model uniform’ of white t-shirts, skinny jeans and Vans. Now, Bosso adores fabrics like silk, plaid and velvet, representing his transition both in the fashion world and within himself. His parents had always imparted on him the notion that we represent who we are and where we come from through clothing. Of course, modelling and fashion are only two of Bosso’s passions, as he takes the first steps towards pursuing music. It may seem as though music is a fresh interest, but Bosso has been singing, composing and choreographing dances from a tender age. He never realised that with some confidence he could take this hobby to a more a serious level. Does he regret waiting so long to get started? No, because “I had to live and experience the world before the music could be worth making”. He cites his biggest musical inspiration as Sade. Others include Bob Marley, Lauryn Hill, Toni Braxton, Lenny Kravitz, Maxwell, Serge Gainsbourg, Jacque Brel, and finally topped with African music. From speaking to Bosso, it is apparent that he is well aware that being a model entails having the potential to create change. He has channelled his influence into bringing awareness to autism and helping families who care for autistic children. Bosso is the eldest of five children. His brother’s early diagnosis of autism created a very personal desire to encourage affected families, and equipped him with first-hand experience on what support systems are required. Bosso and his family have now founded a rest centre which endeavours to provide quality time for families such as his. When speaking about the work of his centre, Bosso becomes more lively, his passion truly shining through. The centre, which can take in ten children at a time, provide a peaceful refuge for the parents. Specialists are present, aiding the children in their cognitive development. The centre also aids children with basic motor skills such as holdings pencils and tying shoes. Perhaps most importantly, in Bosso's words: the centre “helps children have a childhood”, arranging activities like going to the zoo or cinemas, which can sometimes be challenging for families who are afraid of how their children may react to crowds and unusual situations. It is clear that this work is much appreciated and required; they are poised to open a new centre in Toronto which is geared towards the needs of teenagers and older children. Not only is Bosso is compassionate, but he is also astute in understanding the buying power of diversity and how social media has opened doors previously closed. After all, it was the picture of him wearing a flower crown for Vivien Westwood posted by Nick Wooster on Tumblr which helped his career gain traction. 100,000 likes later, his life would be changed forever. Bosso remarks that social media has opened up a whole new market and way of selling. He explains that manufacturers are more aware of who their customers are and that minorities are very important consumers who cannot be ignored. Eloquently, he argues that “culture doesn’t always come from white people - minorities making culture are now on social media”. It is this which has allowed inclusion and diversity to come into advertising. When his career began in 2007, the industry was not open to models of colour. Bosso was given excuses for job rejections such as not ‘fitting the look’ or being too ‘exotic’. At times, he would only work the summer season because black models were ‘in trend’ for these few short months. The sighting of one black model on the runway was a rare achievement. Bosso recalls that his first trip to America at the age of 19 was akin to culture shock. His childhood in Canada greatly contrasted to the segregation and racism he witnessed in the States. Strange stereotypes such as black people not being able to swim made him realise how endemic institutional racism was in the USA. With such a negative representation of black people in the media and the realities of being a minority in America, Adonis is well aware that his public position puts him in a place to change perceptions. “It’s my duty because it’s in my power to make sure I put out a positive representation and inspiration to my community”. He admits that things have moved forward from the days of all-white runways, but a lot of progress is still needed. The box office success of Black Panther (which featured an all-black cast) and the growing acceptance of black models such as Bosso certainly signals a change in the right direction. Yet, even with these great inroads, Adonis is well aware of the conditions which face many African Americans: gun violence, disenfranchisement and abject poverty. It is little wonder, therefore, that he is relentless in the pursuit of his goals and continues to be outspoken on issues of race. He says “I want to help people that look like me, people in my situation, people with similar struggles. I want to have the greatest impact possible.” He certainly seems to be on the right path.